Here is the code tp paste into your tech notes. Beautiful Shot & Comp V!! Wow! This is another amazing image! Gorgeous!! Great sense of composition! V.
Lovely. Such simple comp, but so powerful! Fred, also this one is splendid, what an elegant play of lines! Even more austere in the winter season! Wow - fantastic shot! The color, composition and light all perfect. v! Just perfect! Brilliant composition, color and light! Such a graphic and stylish capture - like a scene from a fairytale. Really nice composition, as well as exposure. Amazing image with perfect exposure and composition. Excelent photo - very good composition. Good contrast of colors! I love simple, powerful images and this IS one. Color, soft shadow on the left sets off the subject. Clouds/sky frames the top. I love it! 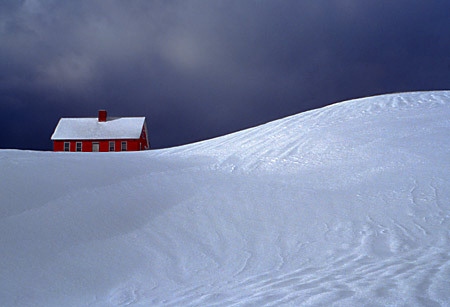 Great composition, and the red house and dark sky stand out well against the snowy hill. nice! like the simplicity in this. Beautiful photograph. I have a 300D Rebel, so this is very inspiring! One incredible composition! Beautiful in it's simplicity. Exquisite in the shadow details. A real winner! VOTE! And fantastic work. Love iT! Stunning in its simplicity. Absolutely beautiful shot. Perfect. This is absolutely outstanding - the composition and the minalmilsm, as well as the feeling of desolation. Have you checked out Wenche Aune's Norweigan shots here on PBase? This was well worth the effort.Lovely ! What a fantastic shot - a minimalist landscape! Love the sinuous, billowy curve of the hillside and the redness of the house against the sky - just perfect. Simple elegance. The line, form and color have combined to create a masterpiece. Well done! It almost loos real. What an amaizing contrast of colors.........I am really jealous!!!!!!! and with that ski in the background? ....."Perfect Calendar image" a real beauty. great pic. perfect light catching the crest of the hill. hope you had your sled with you. i miss the days of sledding on the golf course in Hanover. The composition and color are totally outstanding. This would be great on a wall or a holiday greeting card! Very, very well done. Voted. just looked at you work and you have some nice snow shots. This was taken from a road that winds up the hill to the left (which you do not see) and passes the red house. It is a steep short hill so I just got low and shot up. You can just see this house looking down on it from the red barn shots that are in the NH gallery and the one with the butter cups as well. They are building houses all around it so I have to work to exclude them. excellent snow structure ... how did you do that? I did a black and white of this as an experiment making a black and white from a color image. It was the first time I did the conversion by making the red, blue, and green channels each a seperate black and white layer and then mixing various percents together. I ended up using mostly the green channel and very little of the other two. But using the channels this way I was able to change the gray tone of the house so it was distinguished from the sky. With just desaturating they were both about the same shade of gray and the house was sort of lost. Minimalism is a style that I am very fond of. I just love this image. Simple but very drawing. Very nice.